A warm place to rest and all the food and drink desired describes the appeal of all-inclusive resorts for people -- and food processing facilities for insects and other pests. Specialized skills not deemed core competencies have gradually been pared away and outsourced by food companies. Increasingly that includes pest management. From the perspective of insects, rodents and birds, a food plant is as close to nirvana as they are likely to come. Keeping pests at bay is a task many companies have gladly handed over to local experts, but as consolidation has resulted in geographically far-flung production networks, food companies have gravitated to service providers who can deliver integrated pest management to multiple sites. That in turn is driving service firms to expand their service areas. A recent example is the acquisition of Western Exterminators Co. by Rentokil Initial, a U.K.-based holding company involved in pest control in Europe, Africa and Asia Pacific, as well North America. The acquisition was the latest in a series since 2006 that have vaulted Rentokil North America into the No. 3 position in the U.S. pest control business. The purchase prompted Copesan Services Inc. to forge partnerships with five pest control firms in California, Arizona and Nevada to fill the void left by Western Exterminators and to bolster Copesan's network of 70-plus partner companies. Wholesale bakeries rarely outsourced pest control a decade ago, observes Dave Pettigrew, food safety manager at McCloud Services in South Elgin, Ill., but a steady migration to companies like his has been occurring. "The paperwork is laborious for companies to manage," he suggests -- and paperwork is increasing as food companies try to satisfy the documentation requirements of third-party auditors. McCloud's service area stretches from northern Alabama to southern Wisconsin and West Virginia to Kansas. As part of the Copesan network, it can enlist the support of regional suppliers throughout North America and into the Caribbean, says Pettigrew. Pest control is a prerequisite program and, like good manufacturing practices, a building block for hazards analysis and critical control points (HACCP) programs. Many food companies are loath to outsource such a fundamental responsibility, and they've found they needed chemicals and traps from firms such as Orkin and Terminix. But bans on chemical standbys like methyl bromide and major recalls triggered by the use of unapproved solvents triggered a migration to outsourcing in the past 20 years. Third-party audits and documentation requirements are more recent incentives to scrap in-house programs in favor of integrated pest management services. Those vendors are better able to monitor regulatory changes and incorporate new abatement strategies, although their success hinges on the cooperation and involvement of plant personnel. "In a well-run program, we don't have to spray anything at all," because food-safety personnel and sanitation workers are committed to an integrated management approach, says Tim Larson, corporate QA manager at Rentokil in Reading, Pa. "In reality, pesticides come into play when there are cutbacks and perhaps a sanitation position is eliminated," resulting in inadequate cleaning is select areas. When spraying is necessary, the solutions used by pest control experts are more benign than the chemicals of the past, reducing the potential for product contamination and human harm. When traps must be baited, increasingly the intent is not to kill but to disrupt breeding. A prominent example is pheromones that result in sexually confused insects. A popular choice for food plants is Moth Suppression, a product introduced in 2004 by Insects Limited Inc. that causes male Indian meal moths to pursue other males instead of females. Insect growth regulators (IGR) are a more recent innovation. As with pheromones, mating disruption is the goal with IGR, though the IGR approach differs. Immature insects carry juvenile growth hormones that recede as they approach adulthood; by exposing them to large dosages of the hormone, the bugs continue to eat but never reach the breeding stage. "People want to see dead insects, so there was a lot of resistance to IGRs five years ago," sighs Michelle Hartzer, staff entomologist and product manager at IFC, Lenexa, Kan. Skepticism is receding, however, and plant managers are more accepting of these low-risk insecticides. "You can drink a gallon of this stuff and it won't hurt you," according to Hartzer. IGRs rely on three types of chemicals as their active ingredient. Methoprene can be applied directly to food and is commonly used with stored grain, providing up to two years protection. Hydroprene delivers coverage into cracks and crevices and is very effective against cockroaches, says Hartzer. Pyriproxyfen remains stable when exposed to sunlight. IFC has specialized in food industry applications since its founding in 1937. The initials stand for Industrial Fumigant Co., and fumigation of stored grain was all it did in the early years. Today, fumigation accounts for less than a third of its business. Many food companies source their pest-control supplies and rely on IFC for information updates on usage and new application tactics, such as an Agricultural Research Services study that is examining the optimum particle size for delivery and effectiveness when spraying insecticides. 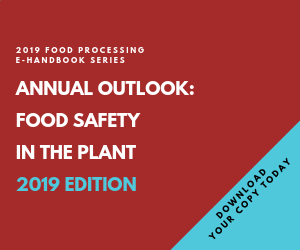 A shift to turnkey service is occurring gradually, and Hartzer doubts the pace will accelerate when new regulations come into play with the Food Safety Modernization Act (FSMA). "Many in the food industry have always gone well beyond what the rules require, though there is a lot more detail with the independent audits, and there will be more paperwork with FSMA," she says. IFC and other suppliers ease the record-keeping burden on both clients and themselves with bar code readers and personal digital assistants, scanning the bar codes at each station and keying in data on number and type of insect trapped. The information is then uploaded to a server and made available on line for trending reports and review by auditors. While a service company can ease a plant's burden, it can't assume all the pest-control responsibilities, she emphasizes. "I can't sweep the floor or fix your broken screens," says Hartzer. "Pest management is everybody's responsibility, from the sanitation crew and maintenance department to the operators on the floor." Alternatives to traditional insecticides and poisons are not the only innovations. A high-tech mousetrap from Rentokil debuted in Europe in 2007, with carbon dioxide providing the kill step instead of poison. Clients can opt for an email alert from the trap when it's time to remove a rodent carcass. Carbon dioxide also plays a role with a bird capture device. The supplier's name sounds ominous — Advanced Weapons Technology in La Quinta, Calif. — but it represents a humane method of removing flighted visitors to a plant or warehouse, according to president Dan Sherman, who markets the device through the website www.humanecapture.com. With a CO² canister as a propellant, the device fires a net measuring 8 ft. by 8 ft. at sparrows, pigeons or other targets in motion, ensnaring them in the mesh for easy removal. The target needs to be moving, Sherman explains, and the net can be fired from 40 ft. or more. "The net acts like a bedsheet," he adds. "It's very difficult to miss and very easy to catch." The first application was six years ago in Singapore, where authorities wanted a nonlethal alternative to Taser guns. A year later, Sherman introduced the pest-control version, which has tighter meshing than the human net. "You could take a mouse down, too, though a mouse might be difficult to restrain," he allows. In any case, the invader can be removed from the facility and released unharmed. One of the biggest users of the device is USDA, which has about 100 units. One of the device's distribution channels is BirdBGone, a Mission Viejo, Calif., firm that manufactures and distributes a broad assortment of traps and exclusion products. Bird spikes that prevent them from landing and electric tracks that deliver a small shock when they try to roost are commonly used, according to Rich Martin, the firm's technical manager. So is netting that attaches to the underside of a dock canopy. "Some people ask, 'Isn't there a spray I can use?'" says Martin. Unfortunately, no, and the best solution usually is site dependent. Sparrows are the most common avian invaders, but pigeons create more problems in plants. In the insect world, the kudzu bug is on the march beyond its native Georgia, and Pennsylvania's brown marmorated stink bug has worked its way west into Illinois and southern Wisconsin. Colder weather will drive rodents to seek shelter, and filth flies like to hibernate in cracks and crevices during the winter months and resume breeding in the spring. Patricia Hottel, McCloud's technical manager, says X-ray technology is sometimes used to examine the underside of concrete slabs to determine if a leaky pipe or other conditions conducive to a pest infestation exist. Her firm also has dabbled with thermal imaging to flag voids in walls. Pest control is a prerequisite program and a building block for HACCP. The expectation of inspectors, auditors and customers is that food processors say what they do, do what they say and prove it. An integrated pest management program meets those requirements, and supplier realignment makes it more likely that multi-site food companies can select a standardized approach from a single vendor.